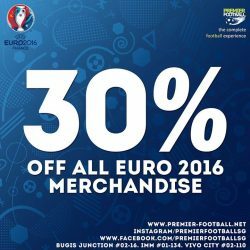 30% OFF ALL EURO 2016 MERCHANDISE! Available both in store and online! 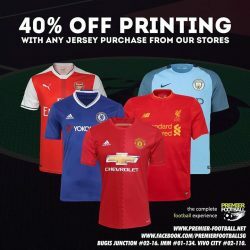 Enjoy a 40% off printing charges when you purchase any jersey from us! We will also be having a large variety of merchandise on sale for this "FOOTBALL FIESTA" event. Head down today and check it out. Located at Takashimaya B1 Talking Hall. We will be there from 9th-19th June. DBS/POSB Cardholders will enjoy an additional 10% discount on 10th-12th June. Enjoy the free SenCilia Printing with purchase of Arsenal 2015/16 Home or 3rd Jersey! In-store exclusive. Grab Premier Football offers their Nike footwear promotion. All Nike footwear at 50% OFF the regular retail price until the 31st of October, exclusively in our retail stores. Calling out all Football Fanatics! 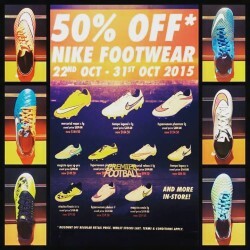 Premier Football will be having a Flash sale on Nike footwear from 22nd Oct till 31st Oct. It starts today! Original retail prices will be slashed down to 50%. They look forward to seeing all of you at their stores and outlet. Hurry down now to enjoy this amazing discounts. Terms and conditions apply. Enjoy Premier Football at Manchester City FC 2013/14 and grab their Home Jersey for only $49.90. 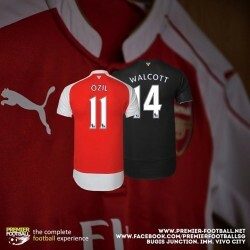 Get them personalised with the official Premier League names and numbers. 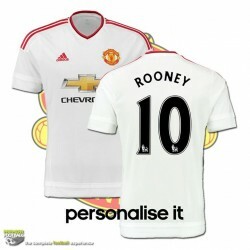 Go one step further and personalise your new Man Utd kit! Enjoy 50% off BPL printing on the new Man Utd 15/16 Away kit. Valid from 14th-16th August 2015 only, and exclusive to Premier Football retail stores. 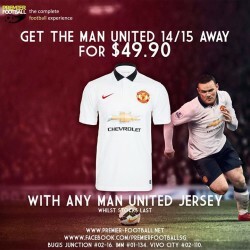 Come and get the Manchester United 14/15 Away kit for $49.90 when you purchase any Manchester United Jersey! Available in-store only.so hurry grab a great deal today! Nike Mercurial up to 40% off. Available both in-store and online @ Premier Football. So, what are you waiting for? Hurry! 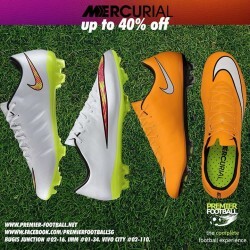 Enjoy and get up to 40% off discount at Premier Football. Available both in-store and online! 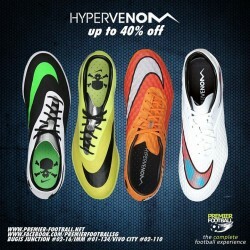 Hypervenom going for a great deal so hurry grab your self a great deal now! Premier Football: offers buy 2 get 1 free. Available in store only. Bugis junction and vivo city. 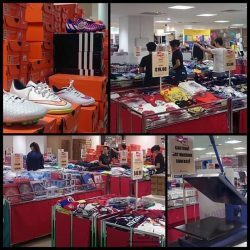 Venue: Premier Football Bugis junction and vivo city. 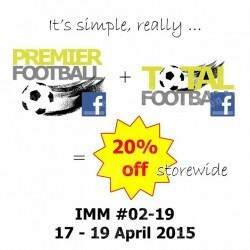 Be a Facebook Fan of both Total Football and Premier Football, and enjoy 20% Off Storewide @ Premier Football IMM. All new Manchester United 2014/2015 products on 20% discount! Available at all Premier Football store and online. All FOOTEEZ, KEMPT, and LIGA ROLLING STONES T SHIRT going for $19.90! Usual price $45.00 - $39.90. Available at all Premier Football stores! 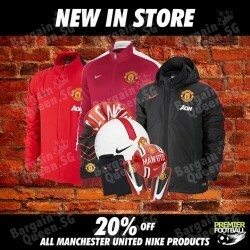 Get any Nike 2014/15 Manchester United Products at 20% off! Choose from 2014/15 Home Jerseys to Backpacks and Training Kit. Additional discounts on 13/14 Manchester United products! Discounts available at all Premier Football stores and online. 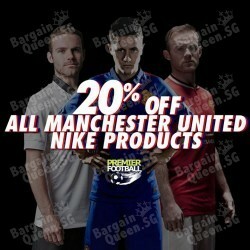 All 2014/15 Manchester United Nike merchandise going for 20%! Additional discounts on past season's merchandise at Premier Football. Available both in store and online. 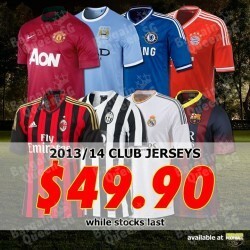 Don't miss their off-season sale on 13/14 club jerseys, with adult jerseys from $49.90! Available exclusively at all Premier Football stores! Get your 2014 World Cup Jerseys printed with official players and numbers. 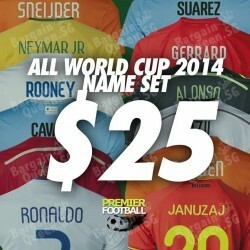 All World Cup 2014 Name sets are going for $25.00. Printing are for both new and used jerseys so come on down! Promotion are whilst stocks last and valid in stores only. 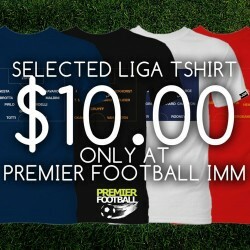 Selected LIGA and FOOTEEZ T-shirts are now going for $10.00 and $15.00 each respectively @ Premier Football IMM Store. ALL COPA and KEMPT T-shirts previously at $49.90 are now $20.00 each.